Crops with an enormous food and feed security role and trade potential are sensitive to any kind of water deficit. Transportation of solutes across membrane has vital role in plant normal physiology and resistance toward stresses. H2O2 involves in cell signaling, boron results in leaf expansion, root elongation, flower, fruit and seed development. Silicon improves resistance against pathogens. CO2 transport is important for green plants. Ammonia and urea play significant roles in cell metabolism. Members of major intrinsic proteins (MIPs) consist of aquaporin channel proteins (AQPs) which facilitate the passive transport of water and small solutes across membranes. Four important subfamilies of MIPs are plasma membrane intrinsic proteins (PIPs), tonoplast intrinsic proteins (TIPs), nodolin-26 like intrinsic proteins (NIPs) and small basic intrinsic proteins (SIPs). In this study, functional properties of MIP channels which have been demonstrated experimentally are reviewed. While PIPs are specific as CO2 transporters, ammonia and silicon are only transported by TIPs and NIPs respectively. H2O2, urea and boron are common substrates for PIP, TIP and NIP subfamilies. Identification of MIP channels which are involved in resistance against biotic and abiotic stresses results in the improvement of cultivar traits. The hydrophobic nature of membrane acts as a rate limiting step in the rapid movement of small polar molecules such as water and natural solutes . Major intrinsic proteins (MIPs) as pore forming proteins in membrane are distributed in organisms from all kingdoms of life. Most members of this superfamily increase the water permeability coefficient by affecting hydraulic conductivity of the membrane, which in turn results in the transportation of billions of water molecules in a second . Other substrates like glycerol, urea, ammonia (NH3), carbon dioxide (CO2), silicon (Si) and hydrogen peroxide (H2O2) are also transported by MIPs in plants . Usually, the former subfamilies of MIPs which are selective/specific for the transportation of water are called aquaporins (AQPs). The later subfamily named aquaglyceroporins (GlpFs), are permeable channels to water and other small molecules . However, AQP is the common term for both subfamilies. Several gene duplications and sub-functionalization result in a large diversification in structure and function of AQPs in plants . In contrast to the thirteen identified MIPs in human , this number ratchets up to 47 in tomato , 66 in soybean , 53 in Brassica rapa , 41 in potato , 55 in Populus trichocarpa , 35 in Arabidopsis thaliana , 71 in cotton  31 inmaize  and 34 in rice [15,16]. Based on sequence homology and subcellular localization, plant AQPs are divided into five subfamilies including plasma membrane intrinsic proteins (PIPs), tonoplast intrinsic proteins (TIPs), nodolin-26 like intrinsic proteins (NIPs), small basic intrinsic proteins (SIPs), and uncategorized X intrinsic proteins (XIPs) . In the early land plants like Selaginella moellendorffii and Physcomitrella patens additional MIPs called hybrid intrinsic proteins (HIPs) are also included [18,19]. Optimum availability of water and solutes is important for health and growth yield of plants. Identification and characterization of MIPs, which are involved in the transport of small molecules like H2O2, boron, Si, NH3 and urea would have a vital role in defense against biotic and abiotic stresses. Although, it is possible to predict the physiological properties of MIPs by in silico analysis ; we herein emphasize on the functionality of those MIPs that have been demonstrated experimentally. H2O2, which is known as a reactive oxygen species (ROS), initiates signaling to provide adaptation to biotic and abiotic stresses at low concentrations. At high concentrations, H2O2 involves in programmed cell death . H2O2 plays a crucial role in plant cell wall lignification, phytoalexin production and induction of defense genes under pathogen attack. Other functions like involvement in plant growth and development, regulation of cell cycle, plant senescence and ABA induced opening/closure of stomata have been attributed to H2O2 . On the other hand, a mechanism to protect cells at toxic concentrations of the molecule is inevitable. Decisive roles of this inter/intra-cellular messenger require tightly regulation and a fast transport mechanism across plant membranes. Several MIPs channel H2O2 in plants . The members of PIP2, TIP1 and TIP2 subfamilies of Arabidopsis and NIP3 subfamily of rice are transporters of H2O2 [24,25]. Yeast expression assays showed that AtPIP2-1, AtPIP2-2, AtPIP2-4, AtPIP2-5 and AtPIP2-7 from Arabidopsis, and ZmPIP2-5 of maize are permeable to H2O2 [24,26,27]. Increased H2O2 permeability in yeasts was observed when several Arabidopsis TIPs like AtTIP1-1, AtTIP1-2, AtTIP2-3 were expressed . Members of the NIP subfamily have also been shown to conduct H2O2. AtNIP1-2, OsNIP3-2 and OsNIP3-3 are transporters of H2O2 [25,27]. Moderating H2O2 effect after pathogen attack might be one of the origins of vast distribution of H2O2 transporters in different MIP subfamilies. Considering its crucial role as the substrate in sugar biosynthesis during photosynthesis, CO2 transport is of extraordinary importance for green plants . After crossing the stomata numerous resistances exist in the path of CO2 to chloroplast stroma, one of which is mesophyll CO2 conductance and/or resistance (gm) . Environmental factors such as temperature, water stress and biotic stresses limit CO2 conductance and photosynthesis . Involvement of MIPs (sometimes called COO porins) for an efficient CO2 transport has been well established . CO2 transporters are distributed within PIP1 and PIP2 subfamilies in plants (Figure 1a) [33,34]. NtAQP1-a member of PIP1-was the first candidate as a CO2 conductor . AtPIP1-2, HvPIP2-1, HvPIP2-2, HvPIP2-3, HvPIP2-5 and NtPIP2-1 are AQPs which have shown CO2 permeability [33,34,36,37,38]. A 40% increase in the gm of leaves has been observed when barly’s HvPIP2-1 was over-expressed in rice . McMIPB an AQP channel from ice plant, which was ectopically expressed in tobacco, transports CO2 and regulates stomata under soil water deficit stress to compensate CO2 deficiency . Photosynthetic efficiency is a sensitive factor of overall plant health. Over-expression of MaPIP1-2 and MaPIP2-6 in banana plants had a pivotal role in drought and salinity tolerance [40,41]. These transgenic plants also exhibited higher photosynthetic efficiency. Suppression of photosynthesis related genes has been widely observed in different stresses. MIP related CO2 transporters might be involved in this response . Identification of CO2 transporters which affect photosynthetic efficiency will increase tolerance to abiotic stresses such as drought or salinity conditions. Ammonia (NH3) and its conjugated acid ammonium ion (NH4+) play a major role in cell metabolism; for example they are the source of nitrogen for amino acid biosynthesis in the cell . Ammonium is found as the byproduct of metabolic pathways and as a nitrogen source in fertilizers. Ammonium transporter (AMT) family is responsible for NH4+ uptake . MIPs called aqua-ammoniaporins have been introduced as passive transporters of NH3 . Involvement of Arabidopsis TIP2 members have been shown in this process . Accumulation of NH3 inside the vacuole and photorespiratory released NH3 in the leaf mitochondria; all require NH3 passage across subcellular compartments. Extra-cytosolic transport of NH3 and cytosolic detoxification can be moderated mainly by MIP channels (Figure 1b) . AtTIP2-1 and AtTIP2-3 have been identified as NH3 transporter at high medium pH. AtTIP2-3 (which under prolonged nitrogen deficiency was down-regulated) involves in vacuolar loading of NH3 . Involvement of TaTIP2-1 and TaTIP2-2 from wheat in NH3 transport is elucidated [45,47]. Manipulation of these transporters would have beneficial effects on nitrogen use efficiency (NUE). Since nitrogen fertilizers might have negative impact on the environment, attentions are toward biological nitrogen fixation (BNF) by bacteria . Presence of MIP transporters of NH3 in plant symbiosome has long been demonstrated . Identification of MIPs involved in such an interaction would have tremendous effect on the growth and quality of plants. Urea, ammonium and nitrate are three major sources of native soil or applied fertilizers for optimal growth and yield improvement . Increasing chemical input of nitrogen fertilizers destructively affect global climate. Less than 50% NUE is considered as serious economic loss . Strategies to improve fertilizer use efficiency will lead to NUE. Due to high nitrogen content and cost effectiveness, more than 50% of nitrogen fertilizers are urea (http://faostat.fao.org). Urea is transported into plant cells either in the intact form or in the form of NH3 after degradation by soil bacteria . Urea acquisition at low concentrations in the soil is mediated by high affinity secondary active transport systems, called DUR3 transporters . In agricultural soils fertilized by urea, AQP mediated passive transport system facilitates urea transport . Urea is also the catabolic product of arginine in mitochondria, which is exported to cytosol probably by an AQP . To detoxify excess urea from cytosol, it transiently stores in vacuole, where AQPs act as a transporter. This is usually the case when leaves are sprayed with urea fertilizers . Members of PIP, TIP and NIP subfamilies have been involved in urea transport in plants, which is a comparable situation to that in mammals. While PIPs and NIPs move urea between apoplast and symplast in plants, TIPs equilibrate urea concentration over different cellular compartments [56-58]. NtAQP1 a tobacco PIP channel and ZmPIP1-5b, which is mainly expressed in maize roots, have shown urea transportation activity [59,60]. NtTIPa (a homologue of AtTIP2-1) from tobacco is highly urea permeable . Tobacco tonoplast vesicles have 75 times higher permeability to urea than plasma membrane preparations. AtTIP1-2, AtTIP2-1 and AtTIP4-1 from Arabidopsis have shown urea permeability when expressed in yeast . Acquisition of nitrogen from urea is either from roots or from leaves after foliar spray. Compartmentalization to vacuole mediated by TIPs is inevitable for storage or detoxification of urea under high fertilization rate . AtTIP4-1 which mainly expresses in Arabidopsis roots loads urea from cytosol to vacuole and is inducible by nitrogen starvation . AtTIP1-3 and AtTIP5-1 with high expression level in Arabidopsis pollen have intermediate and high permeability to water and urea respectively . AtTIP5-1 is responsible for transportation of urea produced from mitochondrial arginase . ZmTIP4-4 (up-regulated in roots and leaves under nitrogen starvation) is also involved in urea passive transport . In a yeast complementation assay, CpNIP1 from zucchini (Cucurbita pepo) has shown urea transport activity . ZmNIP2-1 (expressed constitutively in different organs) and ZmNIP2-4 (abundant in roots and reproductive organs) are involved in urea passive transport . Boosting urea uptake or partitioning by over-expression of genes encoding AQPs promotes urea utilization as nitrogen fertilizer and reduces nitrogen loss from agricultural systems. The structural role of boron as the cross linker of pectin in cell wall has been confirmed . A 1:2 borate diol diester is responsible for the cross linkage of dimeric rhamnogalacturonan II, one of the main components of the pectin polymer . This linkage is essential for normal leaf expansion. Proteomic analysis of Arabidopsis leaves has revealed the major role of boron in nucleic acid metabolism, photosynthesis and protein synthesis . Growing organs are affected by boron deficiency so that leaf expansion, root elongation, flower, fruit and seed development are inhibited. Chlorotic and necrotic symptoms are observed in the marginal regions of leaves in toxic conditions. . In high rainfall regions of the world, boron, which in soil solution usually exists as boric acid is washed out of the soil and leads in boron deficiency. In contrast, in dried and semidried regions with high boron in the soil water, concentration of boron reaches to toxic levels for plants . Although both conditions decrease crop yield, boron deficiency is more common than boron toxicity. Active transport by BOR transporters and facilitated transport of boron by MIP channels control boron uptake by plants . Members of PIP, TIP and NIP subfamily have been shown to be involved in boron transport in Arabidopsis, rice and barley [68-70]. Experimental evidence exists on tolerance of rice to toxic levels of boron provided by OsPIP2-4 and OsPIP2-7 . Over-expression of AtTIP5-1 in Arabidopsis has increased tolerance to boron toxicity . Role of NIP5-1 in boron uptake from root surface, NIP6-1 in boron distribution in shoots and NIP7-1 in floral anthers of Arabidopsis is confirmed [71-73]. Under boron limitation, AtNIP5-1 transcript was increased more than ten folds. OsNIP3-1 has been identified as a boron transporter under boron limitation in rice . Boron toxicity tolerance in barley has been possible by reduced expression of NIP2-1 and NIP2-2, respectively [70,75]. Identification and manipulation of MIPs involved in boron transport would alleviate symptoms of boron deficiency and toxicity. Metalloids have various roles ranging from essential (boron) to highly toxic (arsenic) . Si has not been recognized as an essential element for plant growth but its beneficial roles classify it as a quasi-essential element for healthy growth, when plants are exposed to stress . Si is known as an alleviator of different plant stresses, including salt, drought, metal toxicity and nutrient imbalances. Since Si improves resistance against biotic stresses such as plant pathogens and herbivores, it has 5 been used extensively for disease resistance . Si as the second richest element in the soil is absorbed from roots in the form of uncharged monomeric orthosilicic acid (H4SiO4) and then transports from roots to transpiration site wherein silicic acid precipitates in the form of biogenic silica (SiO2.nH2O), called phytolithis . Si beneficial is due to the silica deposition, which acts as physical barrier to prevent penetration of pathogens and activation of defense mechanisms such as production of phenolics, phytoalexins and lignin . In contrast to dicots, monocots are generally considered as either intermediate or high accumulator of Si . Active, passive, and rejective are three possible mechanisms of Si uptake in higher plants . The influx channel type transporters and efflux transporters are responsible for Si uptake and translocation . The efflux transporter is a putative anion transporter, which by proton gradient promotes active transport of Si. NIP subgroup of MIPs is responsible for AQP mediated transportation of Si in plants. The specific ability for Si transportation has made the NIP2 subfamily as a distinctive feature to predict Si absorption potential by plant species . The first identified MIP, which facilitates the passive Si uptake was OsLsi1 (OsNIP2-1) in rice roots . The other passive transporter of Si, OsLsi6 (OsNIP2-2) is responsible for distribution of Si in the shoot and leaves, which results in an increase excretion of Si in the guttation fluid by unloading Si from the xylem [83,84]. Homologous of Si influx transporters has been reported from other plant species as well. Barley (HvLsi1, HvLsi6), maize (ZmLsi1), wheat (TaLsi1), soybean (GmLsi1), cucumber (CsiT1, CsiT2) and pumpkin (CmLsi1) are the NIP AQPs, which facilitate Si uptake and distribution . EaNIP3-1, EaNIP3-3 and EaNIP3-4 are horsetail MIP transporters of Si in the roots and shoots . It has been shown that in the two diploid species of Musa acuminata Banksi (AA genome) and Musa balbisiana Tani (BB genome) at the high concentration levels of Si supply, plant Si concentration was less than proportional . This suggests not only the involvement of passive transport by MIPs but also the operation of exclusion mechanisms. When the concentration of Si is low to intermediate in soil, Si has been totally depleted, which is associated to the active transport. Henriet proposed that Si moves across four compartments in banana (root, pseudostem, petiol and lamina) . X-ray and SEM analysis have shown that Si concentration increases in banana root epidermis. The inner cortex of banana has the highest deposition of Si, and then a decrease in Si concentration is observed in endodermis and stele . Absorption and distribution of Si has been schematically elaborated in Figure 1c. The involvement of at least two NIP passive transport sites has been suggested. The model assumes that Si is taken by root exodermis, cortex and endodermis, via NIP2-1. Xylem unloading then proceeds through NIP2-2. Figure 1: A visual guide schematically represents the potential role of various MIP subfamilies. a) PIP1 and PIP2 subfamilies are involved in CO2 conductance via stomata guard cells and mesophyll cells in the leaves. b) ZmPIP1-6 transports urea from soil to the cytosol across plasma membrane. AtTIP4-1 loads urea into vacuole for storage under N deficiency or detoxification under high fertilization rate. AtTIP2-1 and AtTIP2-3 diffuse NH3 by passive transport to the cytosol and vacuole respectively. NH4+ is transported actively by ammonium transferase (AMT). c) Si is transported from soil solutions to the root exodermis by NIP2-1. At the proximal side of the endodermis an efflux transporter actively transports Si to the xylem, which is then unloaded by NIP2-2. Filled and dotted arrows represent symplastic and apoplastic pathway respectively. A NIP3-1 is responsible for boron transport. By affecting water permeability and ion transport, different isoforms of MIPs provide a tight cell osmoregulation under stress. This manuscript deciphers the role of different AQPs during development and stress and provides the opportunity to manipulate carbon gain and water use efficiency, which in turn allow crops to cope with environmental stresses. MIPs in higher plants are at least divided into five subfamilies. XIPs with unknown function have been found in dicots but not monocots. PIP channels results in higher tolerance to salt and drought stress. Experimental evidences have demonstrated that PIPs are transporters of H2O2, urea, CO2 and boron. In comparison to the PIP2 subgroup, many PIP1s have little or no water permeability. TIPs are transporters of H2O2, urea, NH3 and boron. NIPs are transporters of H2O2, boron and Si. Although AtSIPs have shown water transport activity, the non-aqua substrate specificity of SIPs have not been yet demonstrated. Author would like to thank Shiraz University of Medical Sciences, Shiraz, Iran. Agre P, Bonhivers M, Borgnia MJ. The aquaporins, blueprints for cellular plumbing systems. J Biol Chem. 1998; 273:14659-62. Maurel C. Plant aquaporins: Novel functions and regulation properties. FEBS Lett. 2007;581:2227-36. Kaldenhoff R, Bertl A, Otto B, et al. Characterization of plant aquaporins. Methods Enzymol. 2007;428:505-31. Benga G. On the definition, nomenclature and classification of water channel proteins (aquaporins and relatives). Mol Aspects Med. 2012;33:514-17. Abascal F, Irisarri I, Zardoya R. Diversity and evolution of membrane intrinsic proteins. Biochim Biophys Acta. 2014;1840:1468-81. Day RE, Kitchen P, Owen DS, et al. Human aquaporins: Regulators of transcellular water flow. Biochim Biophys Acta. 2014;1840:1492-506. Reuscher S, Akiyama M, Mori C, et al. Genome-wide identification and expression analysis of aquaporins in tomato. PLoS One.2013;8: e79052. Zhang DY, Ali Z, Wang CB, et al. Genome-wide sequence characterization and expression analysis of major intrinsic proteins in soybean (Glycine max L.). PLoS One.2013;8:e56312. Tao P, Zhong X, Li B, et al.2014. Genome-wide identification and characterization of aquaporin genes (AQPs) in chinese cabbage (Brassica rapa ssp. pekinensis). Mol Genet Genomics. 2014;289:1131-45. Venkatesh J, Yu JW, Park SW. Genome-wide analysis and expression profiling of the Solanum tuberosum aquaporins. Plant Physiol. Biochem. 2013;73:392-404. Gupta AB, Sankararamakrishnan R. Genome-wide analysis of major intrinsic proteins in the tree plant Populus trichocarpa: Characterization of XIP subfamily of aquaporins from evolutionary perspective. BMC Plant Biol. 2009;9:134. Johanson U, Karlsson M, Johansson I, et al. The complete set of genes encoding major intrinsic proteins in Arabidopsis provides a framework for a new nomenclature for major intrinsic proteins in plants. Plant Physiol. 2001;126:1358-69. Park W, Scheffler BE, Bauer PJ, et al. Identification of the family of aquaporin genes and their expression in upland cotton (Gossypium hirsutum L.). BMC Plant Biol. 2010; 10:142. Chaumont F, Barrieu F, Wojcik E, et al. Aquaporins constitute a large and highly divergent protein family in maize. Plant Physiol. 2001;125:1206-15. Nguyen MX, Moon S, Jung KH. Genome-wide expression analysis of rice aquaporin genes and development of a functional gene network mediated by aquaporin expression in roots. Planta. 2013;238:669-81. Sakurai J, Ishikawa F, Yamaguchi T, et al. Identification of 33 rice aquaporin genes and analysis of their expression and function. Plant Cell Physiol. 2005;46:1568-77. Maurel C, Santoni V, Luu DT, et al. The cellular dynamics of plant aquaporin expression and functions. Curr Opin Plant Biol. 2009;12:690-8. Anderberg HI, Kjellbom P, Johanson U. Annotation of Selaginella moellendorffii major intrinsic proteins and the evolution of the protein family in terrestrial plants. Front Plant Sci. 2012;3:33. Danielson JA, Johanson U. Unexpected complexity of the aquaporin gene family in the moss Physcomitrella patens. BMC Plant Biol. 2008;8:45. Hemmati S. Predicting the functionality of major intrinsic proteins: An in silico analysis in Musa. TIPs. 2016; 2:139-50. Mittler, R. Oxidative stress, antioxidants and stress tolerance. Trends Plant Sci. 2002;7:405-10. Quan LJ, Zhang B, Shi WW, et al. Hydrogen peroxide in plants: A versatile molecule of the reactive oxygen species network. J Integr Plant Biol. 2008;50:2-18. Jang JY, Rhee JY, Chung GC, et al. Aquaporin as a membrane transporter of hydrogen peroxide in plant response to stresses. Plant Signal Behav. 2012;7:1180-1. Hooijmaijers C, Rhee JY, Kwak KJ, et al. Hydrogen peroxide permeability of plasma membrane aquaporins of Arabidopsis thaliana. J Plant Res. 2012;125:147-53. Katsuhara M, Sasano S, Horie T, et al. Functional and molecular characteristics of rice and barley NIP aquaporins transporting water, hydrogen peroxide and arsenite. Plant Biotechnol.2014;31:213-9. Bienert GP, Heinen RB, Berny MC, et al. Maize plasma membrane aquaporin ZmPIP2;5, but not ZmPIP1;2, facilitates transmembrane diffusion of hydrogen peroxide. Biochim Biophys Acta. 2014;1838:216-22. Dynowski M, Schaaf G, Loque D, et al. Plant plasma membrane water channels conduct the signalling molecule H2O2. Biochem J. 2008;414:53-61. Bienert GP, Schjoerring JK, Jahn TP. Membrane transport of hydrogen peroxide. Biochim Biophys Acta. 2006; 1758:994-1003. Flexas J, Niinemets U, Galle A, et al.Diffusional conductances to CO2 as a target for increasing photosynthesis and photosynthetic water-use efficiency. Photosynth Res.2013;117:45-59. Flexas J, Ribas-Carbo M, Diaz-Espejo A, et al. Mesophyll conductance to CO2: Current knowledge and future prospects. Plant Cell Environ. 2008;31:602-21. Kaldenhoff R. Mechanisms underlying CO2 diffusion in leaves. Curr Opin Plant Biol. 2012;15:276-81. Uehlein N, Otto B, Hanson DT, et al. Function of Nicotiana tabacum aquaporins as chloroplast gas pores challenges the concept of membrane CO2 permeability. Plant Cell2008;20:648-57. Heckwolf M, Pater D, Hanson DT, et al. The Arabidopsis thaliana aquaporin AtPIP1;2 is a physiologically relevant CO2 transport facilitator. Plant J. 2011;67:795-804. Mori IC, Rhee J, Shibasaka M, et al. CO2 transport by PIP2 aquaporins of barley. Plant Cell Physiol. 2014; 55:251-7. Uehlein N, Lovisolo C, Siefritz F, et al. The tobacco aquaporin NtAQP1 is a membrane CO2 pore with physiological functions. Nature 2003;425:734-7. Hanba YT, Shibasaka M, Hayashi Y, et al. Overexpression of the barley aquaporin HvPIP2;1 1 increases internal CO2 conductance and CO2 assimilation in the leaves of transgenic rice plants. Plant Cell Physiol. 2004;45:521-529. Uehlein N, Otto B, Eilingsfeld A, et al. Gas-tight triblock-copolymer membranes are converted to CO2 permeable by insertion of plant aquaporins. Sci Rep. 2012;2. Uehlein N, Sperling H, Heckwolf M, et al. The Arabidopsis aquaporin PIP1; 2 rules cellular CO2 uptake. Plant Cell Environ. 2012; 35:1077-83. Kawase M, Hanba YT, Katsuhara M. The photosynthetic response of tobacco plants overexpressing ice plant aquaporin McMIPB to a soil water deficit and high vapor pressure deficit. J Plant Res. 2013;126:517-27. Sreedharan S, Shekhawat UK, Ganapathi TR. Transgenic banana plants overexpressing a native plasma membrane aquaporin MusaPIP1;2 display high tolerance levels to different abiotic stresses. Plant Biotechnol J. 2013;11:942-52. Sreedharan S, Shekhawat UK, Ganapathi TR. Constitutive and stress-inducible overexpression of a native aquaporin gene (MusaPIP2;6) in transgenic banana plants signals its pivotal role in salt tolerance. Plant Mol Biol. 2015;88:41-52. Heinen RB, Ye Q, Chaumont F. Role of aquaporins in leaf physiology. J Exp Bot. 2009;60:2971-85. Britto DT, Siddiqi MY, Glass AD, et al. 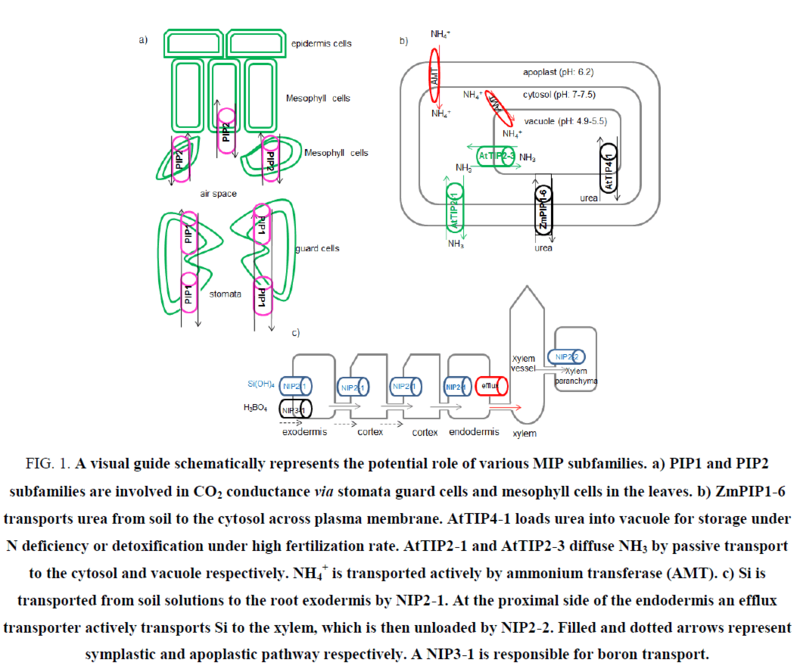 Futile transmembrane NH4(+) cycling: A cellular hypothesis to explain ammonium toxicity in plants. Proc Natl Acad Sci USA.2001;98:4255-8. Coskun D, Britto DT, Li M, et al. Rapid ammonia gas transport accounts for futile transmembrane cycling under NH3/NH4+ toxicity in plant roots. Plant Physiol. 2013;163:1859-67. Jahn TP, Moller AL, Zeuthen T, et al. Aquaporin homologues in plants and mammals transport ammonia. FEBS Lett. 2004;574:31-6. Loque D, Ludewig U, Yuan L, et al. Tonoplast intrinsic proteins AtTIP2;1 and AtTIP2;3 facilitate NH3 transport into the vacuole. Plant Physiol. 2005;137:671-80. Bertl A, Kaldenhoff R. Function of a separate NH3-pore in Aquaporin TIP2;2 from wheat. FEBS Lett. 2007; 581:5413-7. Clarke VC, Loughlin PC, Day DA, et al. Transport processes of the legume symbiosome membrane Front Plant Sci. 2014;5:699. Niemietz CM, Tyerman SD. Channel-mediated permeation of ammonia gas through the peribacteroid membrane of soybean nodules. FEBS Lett. 2000;465:110-4. Pinton R, Tomasi N, Zanin L. Molecular and physiological interactions of urea and nitrate uptake in plants. Plant Signal Behav. 2015;11: e1076603. Witte CP. Urea metabolism in plants. Plant Sci. 2011;180:431-8. Kojima S, Bohner A, Gassert B, et al. AtDUR3 represents the major transporter for high-affinity urea transport across the plasma membrane of nitrogen-deficient Arabidopsis roots. Plant J.2007;52:30-40. Dynowski M, Mayer M, Moran O, et al. Molecular determinants of ammonia and urea conductance in plant aquaporin homologs. FEBS Lett. 2008;582:2458-62. Soto G, Fox R, Ayub N, et al. Tip5;1 is an aquaporin specifically targeted to pollen mitochondria and is probably involved in nitrogen remobilization in Arabidopsis thaliana. Plant J.2010;64:1038-47. Kojima S, Bohner A, von Wiren, N. Molecular mechanisms of urea transport in plants. J Membr Biol. 2006;212:83-91. Gu R, Chen X, Zhou Y, et al. Isolation and characterization of three maize aquaporin genes, ZmNIP2;1, ZmNIP2;4 and ZmTIP4;4 involved in urea transport. BMB Rep. 2012;45:96-101. Liu LH, Ludewig U, Gassert B, et al. Urea transport by nitrogen-regulated tonoplast intrinsic proteins in Arabidopsis. Plant Physiol. 2003;133:1220-8. Yang H, Menz J, Haussermann I, et al. High and low affinity urea root uptake: Involvement of NIP5;1. Plant Cell Physiol. 2015;56:1588-97. Bousser A, Sissoëff I, Roche O, et al. Cloning and characterization of ZmPIP1-5b, an aquaporin transporting water and urea. Plant Sci.2003;165:21-31. Eckert M, Biela A, Siefritz F, et al. New aspects of plant aquaporin regulation and specificity. J Exp Bot. 1999; 50:1541-5. Gerbeau P, Guclu J, Ripoche P, et al. Aquaporin Nt-TIPa can account for the high permeability of tobacco cell vacuolar membrane to small neutral solutes. Plant J.1999;18:577-87. Kim SH, Kim KI, Ju HW, et al. Overexpression of gene encoding tonoplast intrinsic aquaporin promotes urea transport in Arabidopsis. J Appl Biol Chem.2008;51:102-10. Soto G, Alleva K, Mazzella MA, et al. AtTIP1; 3 and AtTIP5; 1, the only highly expressed Arabidopsis pollen-specific aquaporins, transport water and urea. FEBS Lett. 2008;582:4077-82. Klebl F, Wolf M, Sauer N. A defect in the yeast plasma membrane urea transporter Dur3p is complemented by CpNIP1, a Nod26-like protein from zucchini (Cucurbita pepo L.), and by Arabidopsis thaliana delta-TIP or gamma-TIP. FEBS Lett. 2003;547:69-74. Tanaka M, Fujiwara T. Physiological roles and transport mechanisms of boron: Perspectives from plants. Pflügers Arch. 2008;456:671-7. Kobayashi M, Matoh T, Azuma J. Two chains of rhamnogalacturonan II are cross-linked by borate-diol ester bonds in higher plant cell walls. Plant Physiol.1996;110:1017-20. Chen M, Mishra S, Heckathorn SA, et al. Proteomic analysis of Arabidopsis thaliana leaves in response to acute boron deficiency and toxicity reveals effects on photosynthesis, carbohydrate metabolism, and protein synthesis. J Plant Physiol.2014;171:235-42. Kumar K, Mosa KA, Chhikara S, et al. Two rice plasma membrane intrinsic proteins, OsPIP2; 4 and OsPIP2; 7, are involved in transport and providing tolerance to boron toxicity. Planta. 2014;239:187-98. Pang Y, Li L, Ren F, et al. Overexpression of the tonoplast aquaporin AtTIP5; 1 conferred tolerance to boron toxicity in Arabidopsis. J Genet Genomics.2010;37:389-97. Schnurbusch T, Hayes J, Hrmova M, et al. Boron toxicity tolerance in barley through reduced expression of the multifunctional aquaporin HvNIP2; 1. Plant Physiol.2010;153:1706-15. Li T, Choi WG, Wallace IS, et al. Arabidopsis thaliana NIP7; 1: An anther-specific boric acid transporter of the aquaporin superfamily regulated by an unusual tyrosine in helix 2 of the transport pore. Biochemistry.2011;50:6633-41. Takano J, Miwa K, Fujiwara T. Boron transport mechanisms: Collaboration of channels and transporters. Trends Plant Sci. 2008;13:451-7. Takano J, Wada M, Ludewig U, et al. The Arabidopsis major intrinsic protein NIP5; 1 is essential for efficient boron uptake and plant development under boron limitation. Plant Cell. 2006;18:1498-509. Hanaoka H, Uraguchi S, Takano J, et al. OsNIP3; 1, a rice boric acid channel, regulates boron distribution and is essential for growth under boron?deficient conditions. Plant J. 2014;78:890-902. Tombuloglu H, Ozcan I, Tombuloglu G, et al. Aquaporins in boron-tolerant barley: Identification, characterization, and expression analysis. Plant Mol Biol Rep. 2015;1-13. Bienert GP, Schüssler MD, Jahn TP. Metalloids: Essential, beneficial or toxic? Major intrinsic proteins sort it out. Trends Biochem Sci. 2008;33:20-6. Ma J, Yamaji N. Functions and transport of silicon in plants. Cell Mol Life Sci2008;65:3049-57. Ma JF, Yamaji N. A cooperative system of silicon transport in plants. Trends Plant Sci. 2015;20:435-42. Henriet C, Bodarwé L, Dorel M, et al. Leaf silicon content in banana (Musa spp.) reveals the weathering stage of volcanic ash soils in guadeloupe. Plant Soil.2008;313:71-82. Deshmukh R, Bélanger RR. Molecular evolution of aquaporins and silicon influx in plants. Funct Ecol. 2016; 30:1277-85. Chiba Y, Mitani N, Yamaji N, et al. HvLsi1 is a silicon influx transporter in barley. Plant J. 2009;57:810-8. Ma JF, Tamai K, Yamaji N, et al. A silicon transporter in rice. Nature. 2006;440:688-91. Yamaji N, Mitatni N, Ma JF. A transporter regulating silicon distribution in rice shoots. Plant Cell. 2008;20:1381-9. Zhao XQ, Mitani N, Yamaji N, et al. Involvement of silicon influx transporter OsNIP2;1 in selenite uptake in rice. Plant Physiol. 2010;153:1871-7. Gregoire C, Remus-Borel W, Vivancos J, et al. Discovery of a multigene family of aquaporin silicon transporters in the primitive plant Equisetum arvense. Plant J.2012;72:320-30. Henriet C, Draye X, Oppitz I, et al. Effects, distribution and uptake of silicon in banana (Musa spp.) under controlled conditions. Plant Soil. 2006;287:359-74. Jones KW. Silicon in banana plants: Uptake, distribution and interaction with the disease Fusarium wilt. Dissertation, University of Queensland. Australia. 2006.